Cats of Claw Hill Review | A Cat Called Freya, and Teego Too! 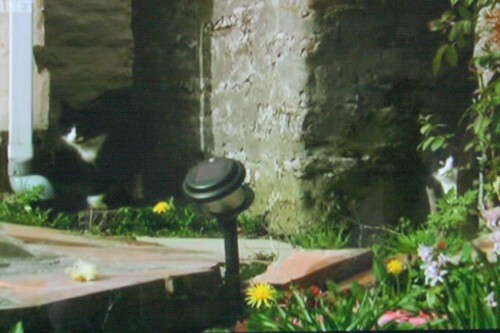 ← Cat TV Programme alert! Oh, and one other thing – please leave a comment below and let me know what YOU thought of the programme? 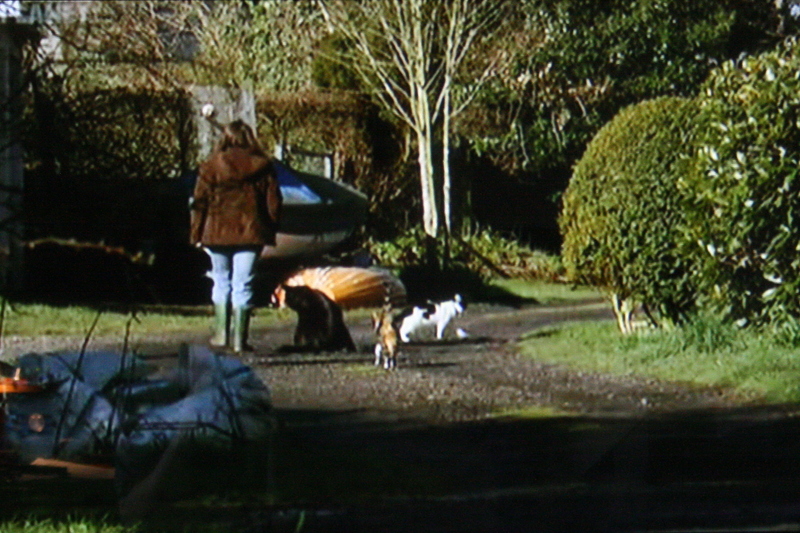 It was an unusual format, as the TV writeup suggests a documentary format, but it was actully shown from a Cat’s eye point of view. The narrator was aparently a cat herself, and spoke about human beans as “two leggers”. It was kind of light hearted, which suited the cat’s commentary, but I’m unsure if that was a good thing. Maybe I’m just too mature, but I’d have preferred a serious cat behaviourist commenting rather than a voiceover pretending to be a cat, as it forced the program to be light, and avoid any REAL insight into the behaviour. On a positive note, the footage they have is incredible! 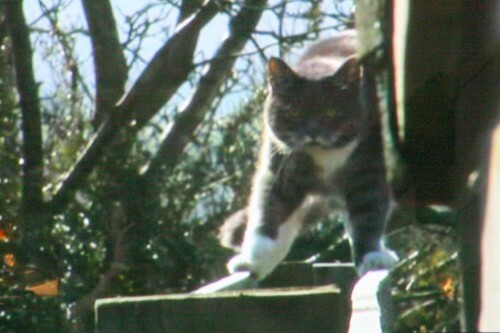 They have lots of footage from the cat’s low-down position, and an incredible variety of behaviour filmed, my favourite (so far) being one cat coming round a corner, and spotting another more dominant cat suddenly as he got there. He then sloped off, with his tail low before the other cat chased him away. I noticed that most of the cats have some sort of tape on their collars, and I guess they were fitted with the Loc8or cat tracking device? That would explain how they managed to get such great footage! Oh wow!! Sounds like fun – thanks for the link – will check it out now! I hope they show it in Australia! I wish they would show it where I live! Sounds like a very interesting program! Thanks for the review, since we can’t get it over here in the U.S. I was wondering how is was and what it was like! Cat documentaries are rare here too, in Canada. Like you, I would have preferred something more educational, but perhaps speaking as a cat appeals to the general masses, and so makes it more watch-able, particularly for the average viewer. Wow! What a fascinating movie it sounds like! Oh man we dont have that here! I hope they play it here that would be really neato! Sounds like a great show. Too bad we don’t get it here! W hope it comes to the US! We would like to see it! Cool! I hope we get to see it here in Oregon someday! We hope this makes it to the US!! Most times UK programs do!! We is very happy to gets to meet you. We will follows you and looks forward to reading your back-posts. Would have been great if we had seen the whole series, for some reason got programmes 1 -4 but then the programming went wonky and we have never seen the rest of the series. I live in London, do not know about the rest of the country. Thanks for the comment, I programmed it in my SKY+, and missed the rest of it too! Wonder what happened? Here in The Netherlands Discovery is showing it too. For the cat-nuts there is little new about the behaviour of cats, but for the cat-newbies it may give useful insights in how the world may look from a cat’s point of view, since I haven’t had seen or heard any buttock-clenching errors. And the footage is just lovely to watch if You have any liking for our feline citizens. we get it here in austria in german translation, it’s called “katzen allein zu haus” and we love it. This cat series is so interesting and educating as well. I can understand cats much better now. Seen that in Animal Planet channel. Hope they continue to do it, as well as many new programs about domestic cats. I am watching Animal Planet and Discovey every day, you cas see all about lions, elephants etc, but nothing about domestic cats. There are shamfully few programs about cats. 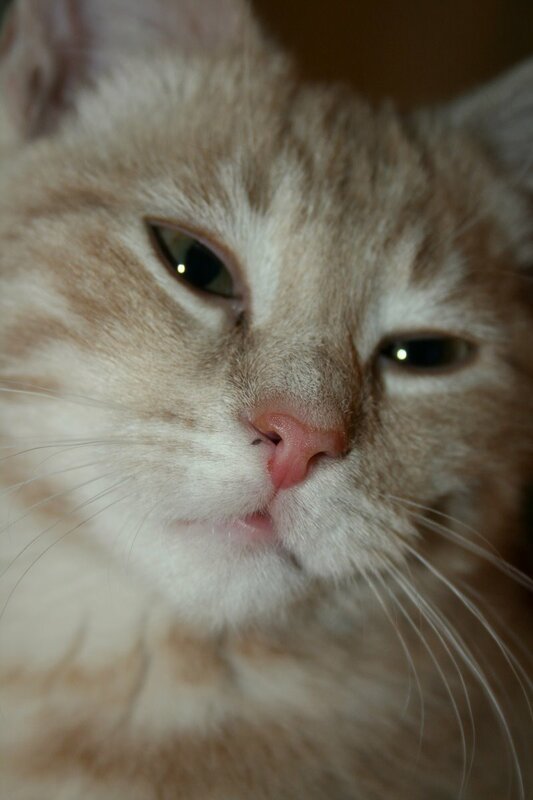 And we are millions of cat lovers in the world, we want to see and know more about them!!! Have anyone details about “tracklist” this series? Which was the firs, second… the last ? I have a kitten called Binksey and he just could not take his eyes of the t.v. 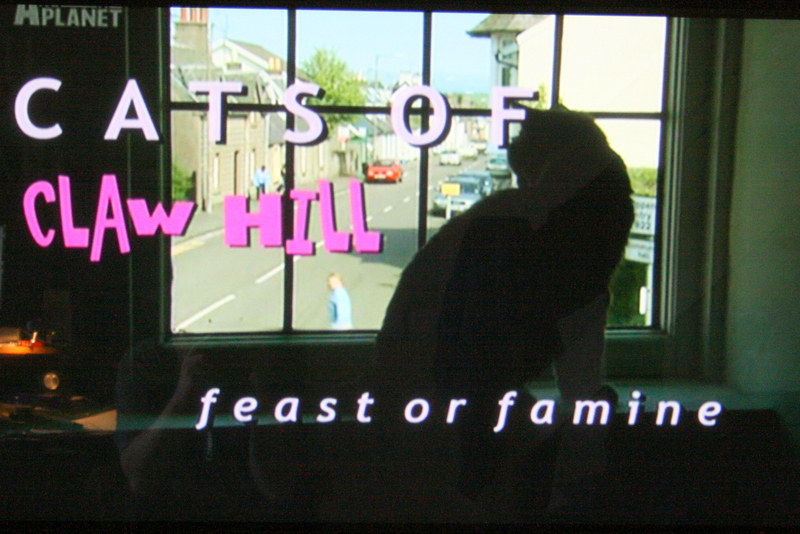 screen when the Cats of Claw Hill were on. I enjoyed it as well. When is it coming back? i live in claw hill[thornhill acutly] where it was made no sings of a second. and it took over a year from the start of filming to the t.v. I loved the series and was wondering if there is a DVD I can buy. I’m from Amsterdam but going to London in December so perhaps there is a store where i can buy it? From where can I download this movie? My human lets me watch this and it’s great! Love the programme. Does anyone know where the location is? I believe it was filmed in Thornhill, Scotland. great little programme, very laid back just like the cats. I love cats and this was so funny, necessary and relaxing..
We absolutely love the programme. Everything about it is great. like too keep the lovely programme. Hi ! We simply loved the show !It has humour,drama,it’s relaxing.Our cat Felix (who doesn’t like watching tv that much )would stay and watch the entire episodes which amazed us.I would really love to buy the DVD if there was out. TOTTALY SICKENING! They slimbag producers put down a plate of bird seeds on the ground in the grass and then set the cat upon the birds till it KILLED ONE. Sorry I am a pro photographer, I know when a shot is set up. I am digusted THIS IS ANIMAL ABUSE. If that wasn;t bad enough at one point some breeder lets about 15 dogs out of their shed, so it that where they all live in a tiny shed whilst the breeder fills their bank accounts and put more and more pets in the pound FACT 1 in 10 dogs find a home.. the rest get PUT TO SLEE. Regarding the cat killing a bird yes it happens but killing one for the entertainment of the viewers is vile. If you had seen the documentary you would have seen how set up it was. I will be posting my views and a petition about this on facebook. KILLING BIRDS / ANIMALS FOR TV RATINGS IS NOT ACCEPTABLE. Hello! I just watched this a few moments ago and thought it was adorable, funny and smart. 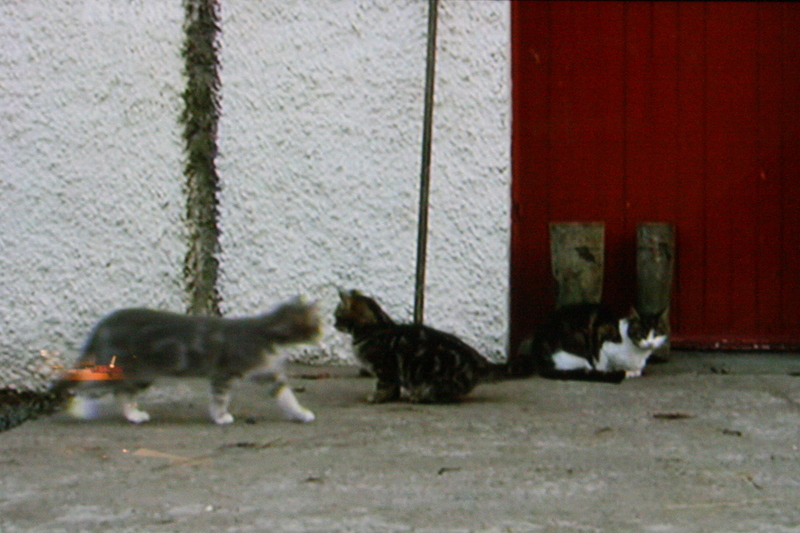 Very simply made, but also a well thought out programme – keeping track of cats is no easy task! I loved the humorous aspects, but agree that some more in depth behavioural analysis would have been good – still there was a simple reasoning given for the way the cats were acting. I thought biting Brian and his lack of a meow was very touching too. I’m sitting here with my moggie Louis who was totally glued to the screen with me, though I think he was more wary of other cats in the living room! I watched this programme for the first time a couple of days ago and thought it was brilliant, so funny and the cats are adorable especially Maurice, what a character. Looking forward to more. Fantastic programme. Wouldn’t miss it for the world. Does somebody of you know when the actual season was filmed? Animal Planet Germany shows only reviews of the 7th season since the last 3 months. Since one month it startet even twice and the staff of Animal Planet Germany has written to me that they wouldn’t know when they get a new season. That’s pedicilous. Thank your for your information in advance. Will it be shown again? ?